Coping with your grief This information has been adapted from a chapter in Bereavement: Helping you to deal with the death of someone close to you, produced by Marie Curie Cancer Care. Grieving is a natural process that can take place after any kind of loss, especially the loss of someone to whom you were very close. Dealing with intense feelings of loss can be very distressing but it is normal – albeit very difficult and painful – to experience very strong reactions. Grief is not an illness. Your feelings are something you experience and not symptoms that have to be treated. Look after yourself physically. Try to eat well and get plenty of rest. It is very easy to overlook your physical needs when you are busy dealing with everything that has to be done after a death or struggling with grief. Everyone grieves in their own way Everyone reacts in their own way when they are grieving for someone who was very close to them. Each person and relationship is special and unique. Don’t worry if you’re not reacting the way other people seem to be, or if someone says you should be feeling or behaving a certain way and you’re not. The important thing is to allow yourself to feel and do what is right for you in your own time. Take your time to make choices Your first reaction may include disbelief and confusion. You may find it impossible to take in what has happened. Even if you were expecting a person to die, the moment of death may have come as a shock, leaving you feeling unprepared and anxious or even angry. There will be some practical things to attend to and decisions to make. Some things do have to be done quickly, but don’t feel you have to rush into decisions if there is no need. Think about what you really want and take your time. You may find it helpful to talk to someone about practical issues. Don’t enter into any financial or legal agreements unless you fully understand them and don’t let others rush you into anything before you are ready. Intense feelings are part of grieving People often find that the first two or three months after someone has died are quite busy with practical things to attend to. It can be after this period that the full impact of your loss may be felt. You may be surprised by the intensity of your feelings. You may become forgetful and find it hard to concentrate. You may experience a whole range of feelings including physical pain and great sadness, isolation, helplessness, anxiety, relief and anger that the person has died. You may be angry at yourself because you wish you had done things differently and now feel you have no opportunity to put things right and be forgiven. You may be angry at the person for dying. You may be angry at the world for your loss, or feel anger towards your god. It is not uncommon to feel relief that the person has died and then feel guilty about feeling this way. There may be many different reasons why you would have such feelings – situations and relationships can be very complicated – but try not to feel guilty because they are also part of grieving. You may also find that feelings return about a previous loss which you thought you were over, or that you now grieve for a previous loss that didn’t seem to affect you at the time. Don’t feel you have to hide your feelings if you don’t want to. Talk about how you feel as much as you need to. You may find you need to talk through your feelings repeatedly. Don’t ignore your grief or try to move on before you feel ready. There is no right or wrong amount of time to grieve. Recovery is not a constant process – sometimes you will feel worse rather than better, but this is normal. You may also find that birthdays, holidays and anniversaries are difficult times, even when you thought you had moved on. You may find it helpful to make some longer term plans so that you have something to look forward to in the future. Grieving within a family Your family and friends will also be experiencing grief which will be unique to them. It can be upsetting if one family member feels very angry while another feels intense sadness and needs to cry, or if one person needs to talk about their feelings while another wants to say very little. Try to acknowledge these differences. Sharing your thoughts and feelings can lessen the loneliness and bring you closer together. Supporting children who are grieving Generally, children under four or five years old do not understand that a person who has died will not come back. Children and young people often need to be reminded of this again and again. Children experience the passage of time differently from adults and can therefore appear to overcome grief quite quickly. However, children in their early school years may need reassuring that they are not responsible for the death of a close friend or relative as they often blame themselves for one reason or another. This is something that anyone who is bereaved may experience, but it is particularly common for this age group. If you are caring for grieving children, it is important to share your grief. Even very young children experience grief and need to be given the opportunity to express their feelings. You may want to protect your child from the pain of grief but, as one mother said: “It isn’t a choice of whether she will hurt or not, but whether I will know about it”. Children often know more than adults realise and they need honest information to help them make sense of what has happened. If you are unsure about how to support your child then it may be helpful to talk to your GP, health visitor, practice nurse, social worker, support group or someone else with experience in such matters. Some Marie Curie Hospices have children and young people’s workers who may be able to offer advice and support. All our hospices can provide you with the following booklets about helping children: • Helping children when someone close dies • Questions children may want to ask when someone close to them has died • Teenage grief – things you might want to know If you are not in contact with a Marie Curie Hospice, these booklets are available from www.mariecurie.org.uk or phone: 0800 716 146 for free copies. If the person who has died was cared for by a Marie Curie Hospice, the hospice will contact you within eight weeks of the death to offer you bereavement support. However, if you would like support sooner, do not hesitate to contact the hospice (which should give you its contact details with this booklet). Most Marie Curie Hospices have social workers, chaplains, a family bereavement support team or other bereavement support services for advice and information. If the person who has died was cared for by another local hospice, try contacting the hospice to see what support or information they can offer. They may recommend other support services in the area. Support us Marie Curie Cancer Care’s services are always free to patients and families but we can only continue our work through the generosity of our supporters. Find out how you can support us through donations, volunteering, events or leaving a legacy in your will. Visit www.mariecurie.org.uk or phone: 0800 716 146. 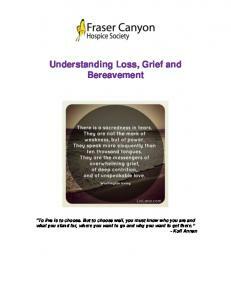 Report "Bereavement Coping with your grief"